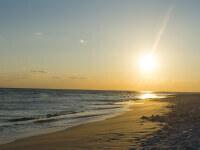 Miramar Beach, Florida (near Destin) is a romantic beach vacation destination that any couple is sure to enjoy. And at Hilton Sandestin Beach Golf Resort & Spa, we’ve got all the amenities you need for your Florida romantic weekend getaway. 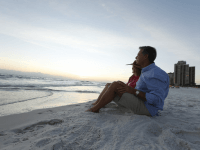 From the beach to the spa and more, there are plenty of romantic things to do at Hilton Sandestin Beach. This one is a no-brainer. Hilton Sandestin Beach Golf Resort & Spa is located directly on the beaches of the Gulf of Mexico. A romantic stroll along the shore is the perfect way to kick off a romantic beach vacation for two. Our award-winning Serenity by the sea Spa is a relaxing retreat conveniently located within the resort. The spa offers a variety of services, including a side-by-side couples massage. Slip into our plush spa robes, grab some fruit-infused water, and indulge in one of a variety of massage styles including Aromastone, Deep Tissue and more. The couple that relaxes together, stays together. What’s a romantic beach vacation without some beach views? Choose to stay in one of our comfortable, luxurious suites with a private balcony overlooking the Gulf of Mexico. Relax to the sound of waves hitting the shore and watch the sun melt into the horizon. Plan your Florida romantic weekend getaway in fall for the optimal viewing experience. We’ve dubbed it the “Sunset Season” — shorter days mean earlier sunsets, and the warm pink, purple and orange glow over the beach is not to be missed. Amp up your sunset viewing with a delicious treat from our in-room dining menu. Order a full dinner to enjoy in the comfort of your room, or just grab a special treat — like a Chocolate Decadence Espresso Tart, ice cream, milk and cookies, and more. We also offer a delicious breakfast menu. Nothing is more romantic than a relaxing breakfast in bed with a Gulf view. For a romantic date night out, we’d recommend Seagar’s Prime Steaks & Seafood. Located within the resort, Seagar’s is the only AAA Four-Diamond steakhouse on the Emerald Coast. The menu is full of top-notch seafood dishes and the finest aged Prime USDA steaks. Plus, Seagar’s has a renowned wine list with over 600 labels. The restaurant's wine list has received top honors, including Wine Spectator's Best of Award of Excellence. Consider reserving a table for you and your date in the exclusive Wine Room, a private dining room for two surrounded by fine wines. In Florida, romantic weekend getaways can be had all year round. Visit us at Hilton Sandestin Beach Golf Resort & Spa and take advantage of the variety of resort amenities we have for couples!